We can help you in the choice of the best RFID, NFC or BLE transponder and the best solution for the required application or project. Our goal is to help You to choose the best transponder. We have all the possible RFID frequencies LF, HF and UHF, NFC transponders and also the most innovative technology BLE and thanks to this we can help you about the choice of the best solution for the appliance or another required project. Besides we are specialized to design, to personalize and to realize tag transponder to face up special needs not available on the current market. 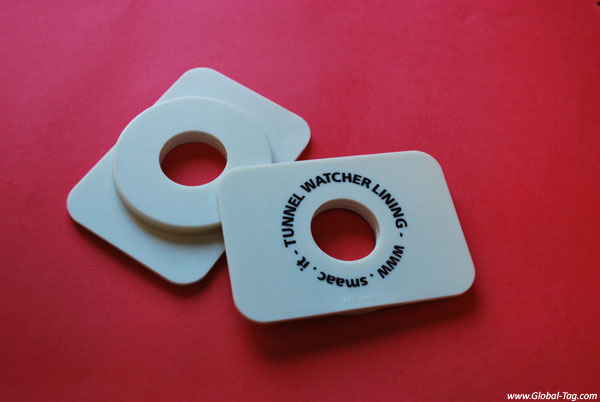 RFID tag UHF Patchy waterproof and flexible with two holes, customizable printing with serial code for automatic trees identification. It allows to identify tree with a long distance and trace the several steps of working . Of course the transponder more complete. Developed to withstand the worst environment conditions, T-Rexy can be applied at any material, also metallic items. It can integrate two different chips with different combinations. If you need it, we can carry out specific stress tests, reading distance tests, type of chip verification at our laboratories. Also the choose of materials is very important in order to determine the right tag transponder: thanks to the wide range and thanks to our competence about materials we can help you about the choose of the best materials; ABS, PVC, Nylon, Ceramic or Silicone, Tyvec, PPS or the natural wood, paper , burglary materials, traditional and cheap adhesives or strong and permanent adhesives. These are some of possible alternatives. The transponder RFID customization is one of the most required solution. Association at data database required by customers ( ex . serial progressive and UID code of the RFID HF transponder or EPC UHF code). Flexibility is our strong point .. we try to satisfy all the requests… We always try to improve our offer.. if we haven’t got the solution, we try to find it.